The unemployment rate by year is the percent of unemployed in the labor force. It tracks the health of the country's economy. Unemployment rises during recessions and falls during prosperity. It also declined during the five U.S. wars, especially World War II. It rose again in the recessions that follow wars. 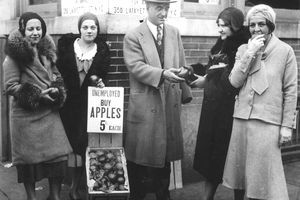 The highest rate of U.S. unemployment was 24.9 percent in 1933. That was during the Great Depression. Unemployment was more than 14 percent from 1931 to 1940. Unemployment remained in the single digits until 1982 when it reached 10.8 percent. The annual unemployment rate reached 9.9 percent in 2009, during the Great Recession. The lowest unemployment rate was 1.2 percent in 1944. You may think that unemployment can't get too low, but it can. Even in a healthy economy, there should always be a natural rate of unemployment. People move before they get a new job or are getting retrained for a better job. Others have just started looking for work and are waiting until they find just the right job. Even when the unemployment rate is 4 percent, it's difficult for companies to expand because they have a hard time finding good workers. Unemployment swings coincide with the business cycle. Slow growth causes high unemployment. As gross domestic product declines, businesses lay off workers. In return, jobless workers have less to spend. Lower consumer spending reduces business revenue. That forces companies to cut more payroll to reduce their costs. This downward cycle is devastating. Keep in mind that the unemployment rate is a lagging indicator. This means it continues to worsen even after economic growth improves. Companies hesitant about hiring workers back until they are sure growth is on a stable upward trend. When the unemployment rate reaches 6 percent, the government steps in. The Federal Reserve uses expansionary monetary policy and lowers the federal funds rate. If unemployment continues, ​Congress uses fiscal policy. It can directly create jobs for public works projects. It can also stimulate demand by providing extended unemployment benefits. Find out more about unemployment solutions. The Bureau of Labor Statistics has measured unemployment since 1929. That's why the table below shows the unemployment rate for every year since the stock market crash of 1929. Comparing unemployment by year to fiscal and monetary policies provides a complete picture of what works and what doesn't. 21.7% 10.8% 1.5% Depression eased thanks to New Deal. 3.6% -1.1% 8.8% Marshall Plan negotiated. 5.2% 5.3% 3.4% Ongoing Stagflation. Watergate break-in. 8.2% -0.2% 6.9% Recession ended. 6.4% 4.6% 6.7% Carter took office. 10.8% -1.8% 3.8% Job Training Partnership Act. Garn-St.Germain Act. 3.9% 4.1% 3.4% NASDAQ hit record high. 5.0% 1.9% 4.1% EU became #1 economy. 9.3% 2.6% 1.5% Obama tax cuts. 8.5% 1.6% 3.0% 26 months of job losses by July. Debt ceiling crisis. Iraq War ended. 7.9% 2.2% 1.7% QE. 10-year rate at 200-year low. Fiscal cliff. 6.7% 1.8% 1.5% Stocks up 30%. Long term=50% of unemployed. 5.6% 2.5% 0.8% Unemployment at 2007 levels. 3.9% 2.9% 1.9% Trump tax cuts. BLS, Unemployment Rate by Year. Data before 1948 is from "Labor Force, Employment and Unemployment, 1929-1939: Estimating Methods."